The professional appearance of the ProLite LH5581S incorporates a slim design featuring a sleek bezel. Featuring IPS panel technology this elegant display ensures exceptional colour accuracy and vivid, life-like quality from all angles. The LED-backlit technology guarantees low power consumption and reliable long-term operation. Built in expansion slot supports the Open Pluggable Specification (OPS) standard; it simplifies the installation of a plug-in PC for digital signage applications. Landscape and Portrait friendly, ProLite LH5581S is designed for a continues operation. 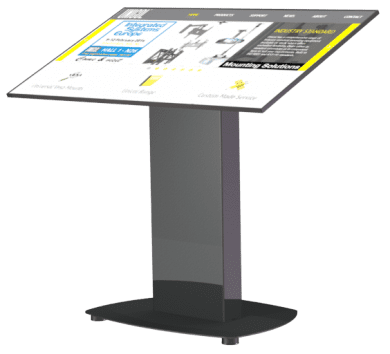 Exhibition stands, retail shops, window displays, events, product launches, museums, transportation terminals, shopping malls, office lobbies, control rooms and fashion shows. -Touch is detected because electrical characteristics of the sensor grid change when human finger is placed on the glass. We have been supplying the latest touch screen technology since 2008. Let us make your event look amazing.